Taking care of your children’s teeth is an important task. Emphasising the urgency and importance of dental hygiene to your children from a young age is beneficial for a healthy and happy future. Unfortunately, there are many problems that can occur for a child if their teeth are not cared for from a younger age. To help, our dentist in Berwick has answered some frequently asked questions about children’s dentistry for your convenience. When should I start worrying about my child’s oral hygiene? Once they are teething it is important to stay on top of their oral hygiene. The time of arrival for babies’ teeth can vary, but will typically start to happen at around six months old. They should have all their teeth by 2-3 years of age. It is important to start cleaning your children’s teeth as soon as they start to appear as baby teeth are particularly vulnerable and susceptible to infection and decay. How do I know my child is teething? Teething is not an easy time for a child. The baby teeth will force their way through the gums, which often causes discomfort for children. What can I do to ease the teething process? Teething rings are a great way to help ease your child’s pain during this difficult period in their life. Just put them in the fridge to cool them down before giving it to them. This can also work for other cool and firm objects such as damp towels or dry, sugar-free biscuits. Washing your hands and then gently rubbing their gums is another way to ease the pain. What sort of problems can come out of poor dental hygiene for children? Tooth decay is very common in children and babies. They are susceptible to it as soon as their teeth begin to come through. A decayed baby tooth can cause dental issues in the future. If a child looses a tooth due to decay then it can cause problems such as malocclusion – otherwise known as crowding – which can cause the teeth to come through misaligned and bunched up, as if there’s not enough room for them to grow comfortably. Children are also not immune from receiving abscesses, which can cause immense pain. If you notice bleeding or pus coming from the gums then you should visit our dentist in Berwick immediately. How do you take care of your child’s teeth? Taking care of your child’s oral hygiene is an easy and essential task. Our dentist in Berwick recommends using a soft, wet cloth or toothbrush to gently wipe their initial baby teeth and gums twice a day until they’re around 18 months old. At this point it is recommended you start using low-fluoride toothpaste to brush their teeth until they’re seven years of age, which is when they can begin brushing their own teeth under your supervision. It is also a good idea to offer praise and encouraging words whenever they do brush their teeth on their own for positive reinforcement. Flossing is something that should also be done as soon as your child grows two teeth that are next to each other. We recommend flossing your child for them until the age of 10, after which they may take over under your supervision. Remember to change toothbrushes every three months. Strongly encourage a brushing and flossing routine in your child for when it comes time for them to do it on their own. Make sure they brush after they eat and before they go to bed. Teach them how to brush properly – circular motions around their teeth and gums for two minutes. Also remind them not to swallow the toothpaste. It is a good idea to visit our dentist in Berwick within six months of your child growing his or her first baby teeth. To ensure good association with dentist visits, you should always treat it as a fun excursion rather than a threat. We recommend a checkup every six months. That way we can ensure that everything is progressing smoothly and there are no problems occurring, such as cavities. Regular visits twice a year can also help your child acclimatise to the environment of the dentist, which can cause less stress growing up. 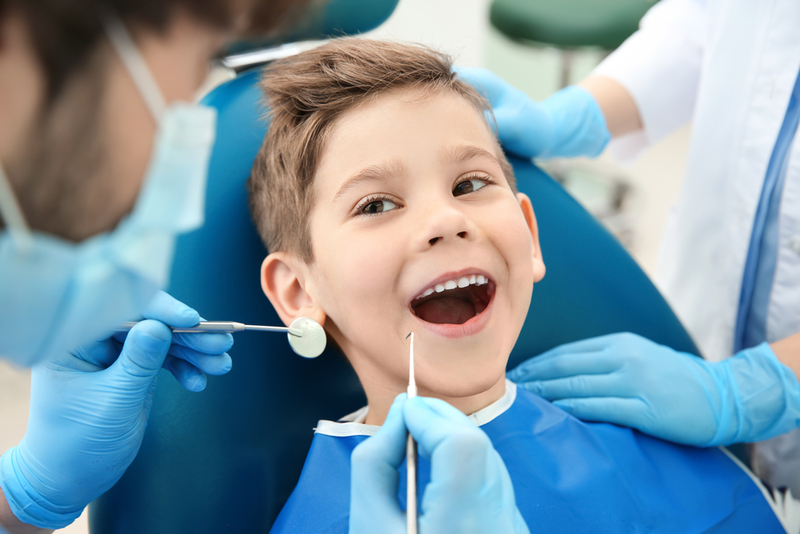 As your local dentist in Berwick, we offer a range of services in a child-friendly environment. If you have any further questions in relation to your child’s oral hygiene, please do not hesitate to contact Eden Rise Dental on (03) 9702 6111, or fill out one of our online forms here.